Around 40% of our Spanish students are Russians. They love Spain and its culture and they really want to learn our language. Russians like so much Don Quixote (I guess because he has many things in common with Russian culture, focused on trying to change the world in an idealistic way). Anna Vakhrusheva is one of them. She’s been studying Spanish with us for more than a year because her husband is Spanish and also because she needs it for her career. Do you want to know more about her? 1. Why do you study Spanish? I study Spanish because my husband is Spanish, so I had to learn his language to communicate with his family and friends. ¿Por qué estudias español? Estudio español porque mi marido es español, así que tuve que hacerlo para poder comunicarme con su familia y amigos. 2. Why did you choose SpanishviaSkype? Before, I tried to study Spanish by myself with some books and audio materials. But I needed real explanation of gramar. Then I found a link to SpanishviaSkype in Internet and tried a trial with Ángel. At the very first class I understood all that I thought was too difficult and felt myself more confident and was excited to continue my studies with SpanishviaSkype. When I started to study with them I was at a B1 level; now, I am at a B2 level. ¿Por qué elegiste SpanishviaSkype? Al principio, intenté estudiar español por mi cuenta con algunos libros y material de audio, pero me di cuenta de que necesitaba explicaciones sobre gramática. Entonces, encontré SpanishviaSkype en Internet y tuve una clase de prueba con Ángel. Ya en nuestra primera clase entendí todo lo que pensaba que era difícil y empecé a ganar confianza en mí misma, lo que me motivó a continuar estudiando con SpanishviaSkype. Cuando empecé mis clases con ellos tenía un nivel B1 y ahora tengo un B2. 3. What do you like the most about SpanishviaSkype? I study with Spanishviaskype for more than 1 year. The most that I like is professionality of my teacher. And of course flexibility of clases is very important when you live in a big city and dont have much time. ¿Qué es lo que más te gusta de SpanishviaSkype? Estudio con SpanishviaSkype desde hace más de un año y lo que más me gusta es la profesionalidad de mi profesor. Y, por supuesto, la flexibilidad de horarios es muy importante cuando vives en una gran ciudad y no tienes mucho tiempo. 4. What do you consider most difficult about the Spanish language? 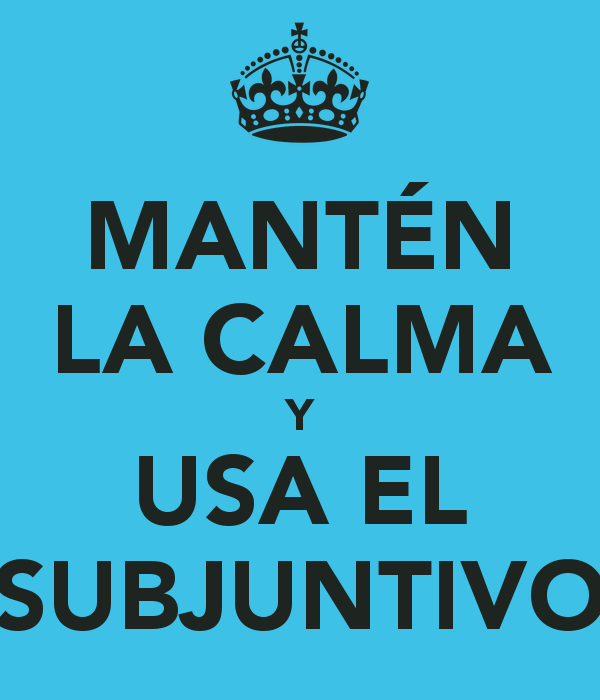 For me the most difficult is subjunctive. As you can’t find it in Russian, neither in English. And, of course, I still make errors with por and para. ¿Qué es lo más difícil del español para ti? 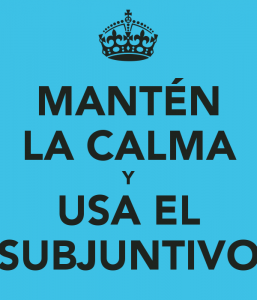 Para mí, lo más difícil es el subjuntivo, que no existe ni en inglés ni en ruso. Y, por supuesto, las diferencias entre “por” y “para”, un tema con el que sigo cometiendo errores. 5. Have you ever been to Spain? I have been in Spain 5 or 6 times. I like its cuisine, wheather and positive character of spanish people. Their friendliness and hospitality make you come back again and again. ¿Has estado alguna vez en España? He estado en España 5 o 6 veces. Me gusta su cocina, su clima y el carácter positivo de su gente. Su simpatía y hospitalidad hacen que quiera volver una y otra vez. Edad: 27 years old / 27 años. Tu palabra favorita en español: I like the expression “menos mal”. It has more positive than negative character / Me gusta la expresión “menos mal”. Tiene una connotación más positiva que negativa. 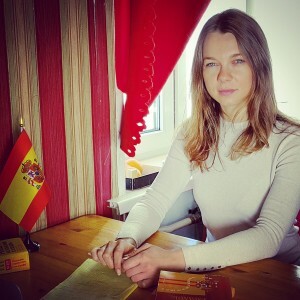 ¿Por qué recomendarías SpanishviaSkype?Spanishviaskype is the best option for those who value teachers profesionality and want to succeed good results in studying of Spanish language / Spanishviaskype es la mejor opción para aquellos que valoran la profesionalidad de los profesores y para los que quieren obtener buenos resultados en su estudio del español. If you want to be fluent in Spanish (as Anna), you only need to ask us for a free trial class and if you like it, you can start learning Spanish now! !